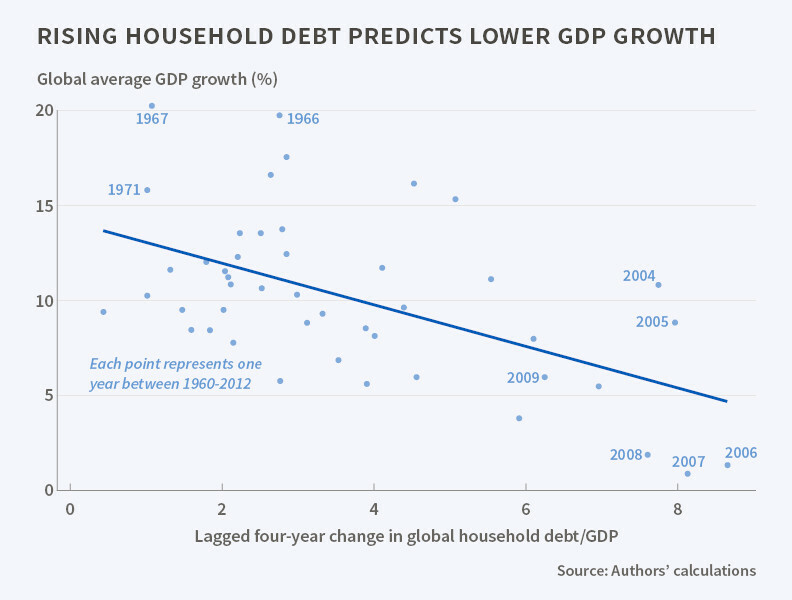 Scooper - Technology News: How does household debt impact GDP growth? How does household debt impact GDP growth? An increase in household debt in relation to a country's GDP is, at least in the short to medium term, a strong predictor of a weakening economy, according to an analysis of data from 30 nations by Atif R. Mian , Amir Sufi , and Emil Verner . The researchers use slowing growth and rising unemployment as key indicators of weakening. They find that the household debt factor is a better predictor of downturns than the debt of non-financial firms. In Household Debt and Business Cycles Worldwide (NBER Working Paper No. 21581 ), the researchers analyze databases from the Bank for International Settlements, the World Bank, the Organization for Economic Cooperation and Development (OECD), and the International Monetary Fund (IMF) over the last half-century. They find that a rise in household debt, largely produced by more readily available credit, is a valuable forecaster of a contracting economy, citing as a prime example the growth of household debt in the early to mid-2000s and the slowing of global growth in the latter part of that decade. The researchers see lower credit spreads and increases in risky debt as primary factors driving the rise in household debt. The availability of cheap credit spurs borrowing to finance higher consumption. In particular, household spending as a share of income rises during household debt booms, as do total imports and the share of consumption goods in total imports. The expansion in household debt is followed by a sharp slowdown in GDP, consumption, and investment growth. This slowdown is not anticipated by professional forecasters at the IMF and OECD, giving household debt the ability to predict growth forecast errors. The expansion in household debt is also followed by a sharp reversal of the current account balance, driven primarily by a fall in imports. If a number of countries are experiencing household debt growth at the same time, net export margins are unlikely to help an individual country export its way out of a downturn. Countries with a household debt to GDP cycle in line with that of the global debt cycle therefore see even larger declines in future output growth following a rise in household debt. The researchers state that their approach to relating changes in household debt to subsequent GDP would have predicted a fall in global GDP growth during the 2007 to 2012 period. "The Great Recession was not an extreme outlier," they write, but "followed a pattern we would expect given the tremendous rise in global household debt that preceded it." They acknowledge that predicting economic developments is prone to error and miscalculation, but argue that their study nevertheless suggests that considering periods of rapid growth in household debt in relation to GDP is a useful means of foreseeing periods of economic retrenchment.